Today, October 11, is National Coming Out Day, which celebrates LGBTQ+ people and the right to live their lives openly. The day commemorates the National March on Washington for Gay and Lesbian Rights and acknowledges the struggles that LGBTQ+ people face when coming out, and instead transforms them into reasons for celebration. I’ve been more confident in owning my identity since working at NETWORK, where one of our four values of inclusion is to welcome and affirm the LGBTQ+ community. It can be daunting to be associated with a Catholic organization and simultaneously be a member of a group the church often actively discriminates against. But I hadn’t always felt so unquestioningly welcomed in Catholic spheres: National Coming Out Day was a trepid joy entirely unfamiliar to me until a few years ago. I had tip-toed my way out of the closet during my entire senior year of college, painstakingly and anxiously. I finally reconciled the fact that I was gay that same April. I was afraid, lonely, and liberated. At age 21, I had absolutely no idea that being gay was a possibility for my life, much less being able to recognize it in myself. In part, I blame it on Catholicism and the not-so-welcoming attitudes towards the LGBTQ+ community that still permeate today’s church. Overarching homophobia is still present in the church and our greater society. I had only been out for a few months before the Pulse nightclub shooting in Orlando, when I realized the tense societal climate into which I’d stepped. Hate crimes still happen. There have been more than 20 trans women of color killed in the U.S. so far this year. A nine-year-old boy died by suicide when he was bullied after coming out as gay to his classmates, and they told him to kill himself. Recently, a Catholic parish in Chicago burned a rainbow flag, even after the archdiocese told them not to. Discrimination and hatred of the LGBTQ+ community is still alive and well, and much of that ugliness is rooted in warped religious beliefs. I wept, too, when I let go of the idea that I had to be straight. I had always been gay; what had died was my own self-expectation, and the presumably-straight self I had constructed. It was painful to grieve the self I was losing, and instead lean into this new life. Coming out felt like dying, but it also felt like rising again – like resurrection. The process of reconciling my church, my faith, and my sexuality was an enormous hurdle, and I still struggle with it. 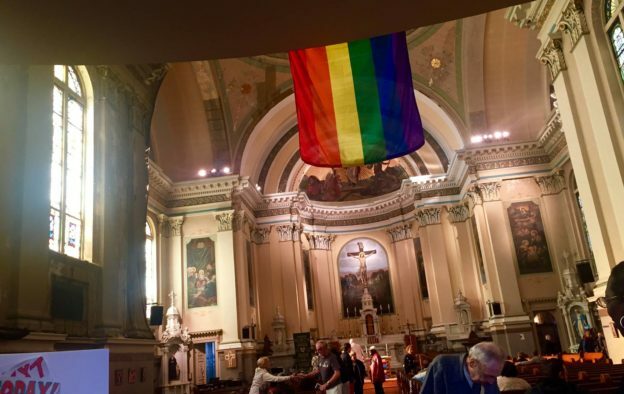 No Catholic I knew growing up was out, and the few LGBTQ+ adults I encountered later on were always cautious about sharing their sexuality in Catholic spaces. I devoutly attended CCD classes as a child, and later paid rapt attention in high school theology. I have been in too many rooms where the words “Catholic teaching” and “unnatural” and “not God’s plan” had been thrown around. Morality automatically meant heterosexuality; at least, that’s what I absorbed. These words made me uncomfortable and defensive, but I never knew why. A few months into my year as a Jesuit Volunteer, I came out to my spiritual director amidst shallow breaths and a racing heartbeat. I knew she’d be accepting of me, but as with many LGBTQ+ Catholics, I am perpetually on the defensive when it comes to not knowing if people will truly accept me in a religious setting. And it is. I don’t remember when I became a part of the church, or how I knew I was gay. Both of these things have simply always been a part of me and have shaped my worldview. My sexuality is inextricable from my spirituality; I can’t dissect the ways in which I experience God without including my queerness. My spirituality has shown brighter in places like El Paso and Ecuador and Philadelphia and Seattle—and yes, too, in attending a church service with a woman I dated briefly, our hands intertwined as we acknowledged the God among and within us. Yet coming out has also meant living amidst fear, and deciding to rise above it. When I came out, a spiritual dam broke within me; I was no longer holding myself back. I celebrate National Coming Out Day, now, as a recognition of my desire for changes in our society and in the Catholic Church: a sharing of vulnerability in the hopes that it will spur something new. Each time I come out to someone (especially in a Catholic setting), I put aside my fears and feel another small part of myself owning my identity. I understood, more concretely, that I too was made in the image of God – that we are all made in the image of God. The shame still exists, but it’s dwindled. What takes its place, now, is the understanding that I am whole as I am created, and my sexuality is inextricable from who as I am as a person. In coming out, my relationship with God has strengthened, and I feel more full: at home in my skin, in myself. In the same way, I feel that I am able to be at home at NETWORK. I don’t have to fear that I will be judged or fired or scorned for my sexuality; many others don’t have that luxury and that freedom. To be in such a place is a gift, a sigh of relief. Coming out, for me, was a personal challenge, but a spiritual one as well. It still is; I’ve questioned my place in the Church, if I still wanted to be part of an institution with a tenuous relationship to its LGBTQ members. Yet painful as it can be, I couldn’t imagine my life without my deep-ingrained Catholic faith, or the fact that I’m gay. I’ve decided that coming out is better than staying hidden, and embracing myself as both gay and Catholic is often difficult, but life-giving. I shouldn’t have to compromise myself, nor should any Catholic in a similar situation. Happy National Coming Out Day, all. You are exactly wonderful as you are. This entry was posted in Emerging Justice Seekers, Front Page on October 11, 2018 by lindsay.